1964 marked John Ford’s forty-seventh year as a director. By then, he accumulated six Academy Awards (four for Best Director and two for Best Documentary), produced numerous box office and critical hits, and in Andrew Sarris’ overview of American Directors the year before, he placed John Ford in the list of “pantheon directors” along the likes of Howard Hawks and Alfred Hitchcock. 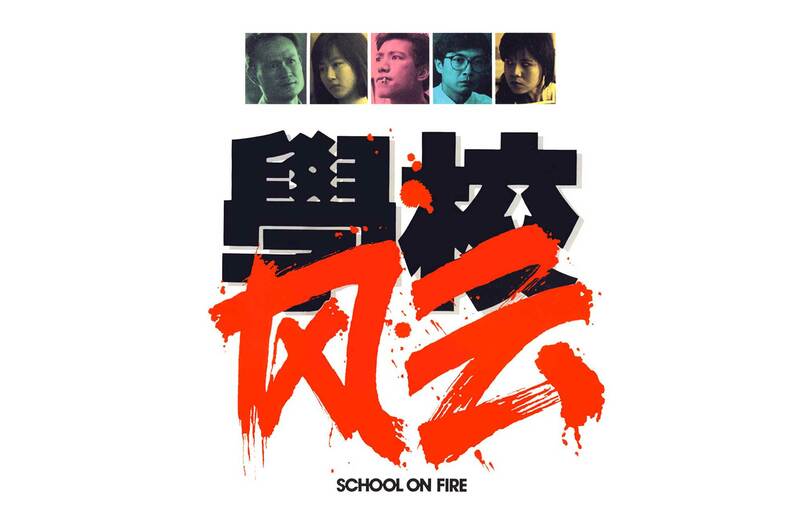 But as history goes, a cultural revolution of sorts was to morph and evolve the desires of American audiences. John Ford’s stately poetry of the American west, a genre he revitalized and reinvented numerous times, now was starting to seem like an antique. Though his post-war westerns carried the type of dread that former soldiers brought home after the war, ideologically and politically they were increasingly out of date as American movies became increasing radicalized. Men proudly wear their uniforms without anguish and internal conflict, men and women fit into their classic cinematic gender roles of masculine protectors and maternal figures of innocence, and the Native American was the enemy of the white man. The then sixty-nine-year-old filmmaker knew his time was nearing the end and decided to go out with one last western: Cheyenne Autumn. 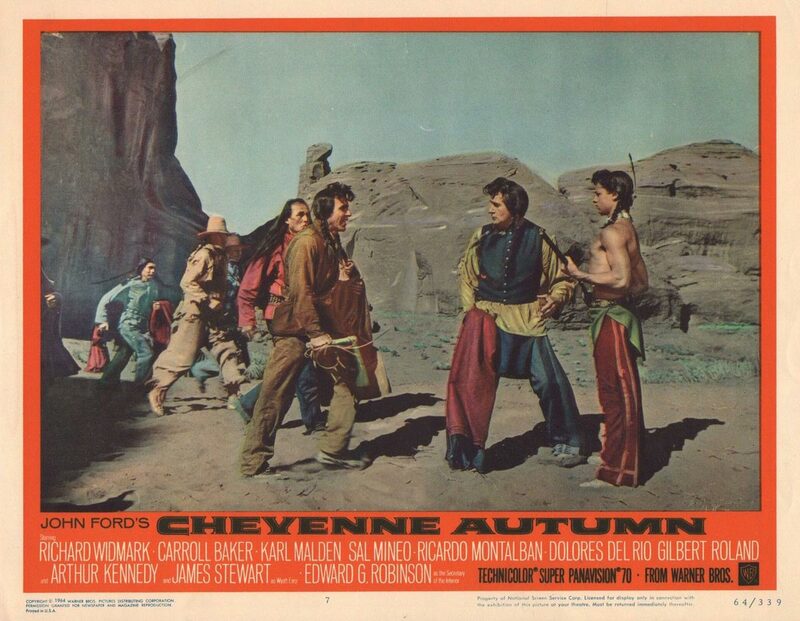 Cheyenne Autumn has its roots in the whitewashing of America’s westward expansion that turned into legend by the western genre. In a 1966 interview with future filmmaker Peter Bogdanovich, director John Ford admits “I wanted to make it for a long time. I’ve killed more Indians than Custer, Beecher and Chivington put together… Let’s face it, we’ve treated them very badly – it’s a blot on our shield; we’ve cheated and robbed, killed, murdered, massacred and everything else, but they kill one white man and, God, out come the troops.” As John Ford was increasingly marginalized in Hollywood, he turned to the Native Americans he loved and respected as his basis for his last western. But as history would have it, the production itself was plagued by the same type of studio meddling John Ford fought against his entire career. 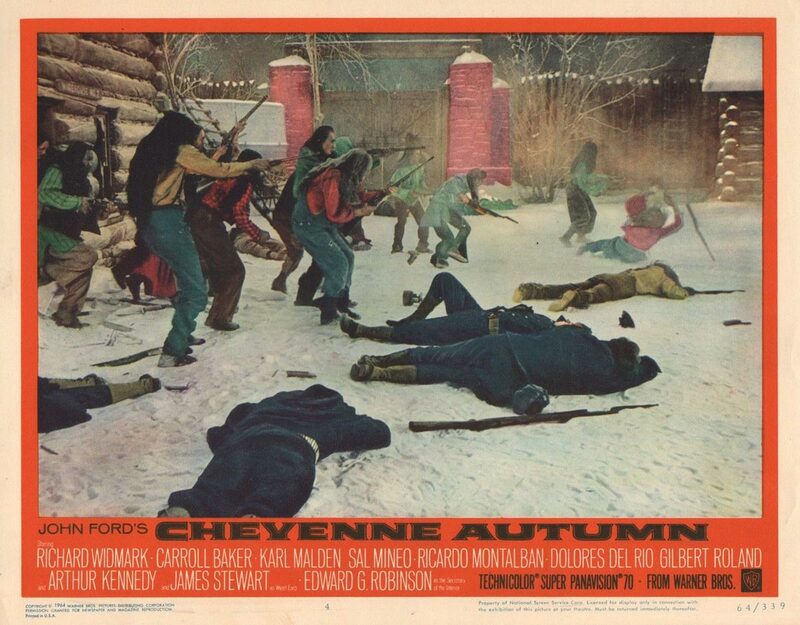 As often the case with Ford, Cheyenne Autumn is very loosely based on historical fact, this time taking from the Mari Sandoz’s book of the same name. In 1878, the Cheyenne nation has been whittled away from 1,000 to about 300. After their pleas for aid from the United States government are ignored, the Cheyenne rebel by rejecting the United States’ reservation and returning home to their native Dakota on an 1,800-mile trek along with a Quaker teacher, Deborah Wright (Carroll Baker). Captain Thomas Archer (Richard Widmark) pursues them in a journey that takes his troops through multiple seasons and vistas. The film switches perspectives regularly from Archer, who is completely sympathetic to the Cheyenne people while continuing to follow orders, and the Cheyenne themselves, who are presented as frustrated, proud, and at the end of their rope. Archer himself narrates the tale with a sense of contempt for his superiors and sentiment for the Cheyenne. 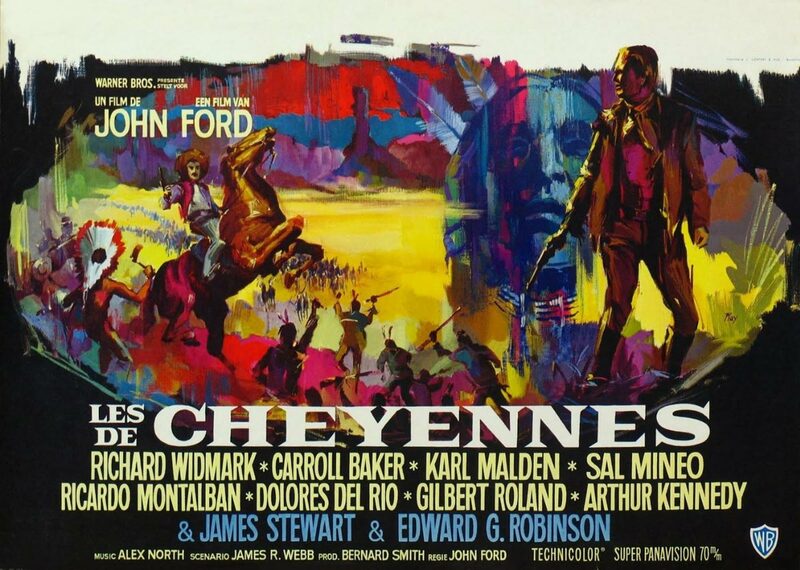 John Ford originally intended to cast the native Navajo of Utah to substitute as the Cheyenne nation, including lead speaking roles as the heads of their tribe, but this was met with heavy criticism from the studio. Previously, he featured actual Native Americans in his films in loving, documentary-like shots, but never in major speaking performances. Important characters were usually reserved for white actors in brown face like Henry Brandon as Scar in The Searchers (1955). When the studio wouldn’t budge, Ford suggested casting actors with partially Native American blood including Anthony Quinn and Woody Strode, but Warner Bros. eventually strong-armed Ford into casting Ricardo Montalban as Little Wolf, Gilbert Roland as Dull Knife, and Sal Mineo as Red Shirt. The compromise seemed to be completely against Ford’s intentioned vision of the film and accounts of the shoot lead you to believe he suffered from a lack of enthusiasm and indecision. But even with this sacrifice made, there’s no diluting the love Ford had for the Navajo. And that love shows in the close-ups he gives them which have more power and care than any similar shots the stars are given. Ford worked with the Navajo since Stagecoach (1939) and they shared a similar esteem for him by giving him the name Natani Nez, or Tall Soldier, for helping create jobs each time he filmed in Monument Valley. Production continued to be troubled for the director. The studio forced Ford to cast Carroll Baker instead of the middle-aged actress he was looking for, John Ford struggled with health issues from his years of smoking and drinking, an over-bearing score by Alex North was tacked on which lacks the Wagnerian scope of Max Steiner or the subtly of American folk music, and co-star Spencer Tracy, who was to play the liberal politician Carl Schurz, became too ill to finish the film and had to be replaced by Edward G. Robinson. Due to the picture’s costs, the scenes in Monumental Valley with Tracy had to be discarded and reshot with Robinson against rear-projected images from earlier in the shoot, adding a surreal dimension to the film. 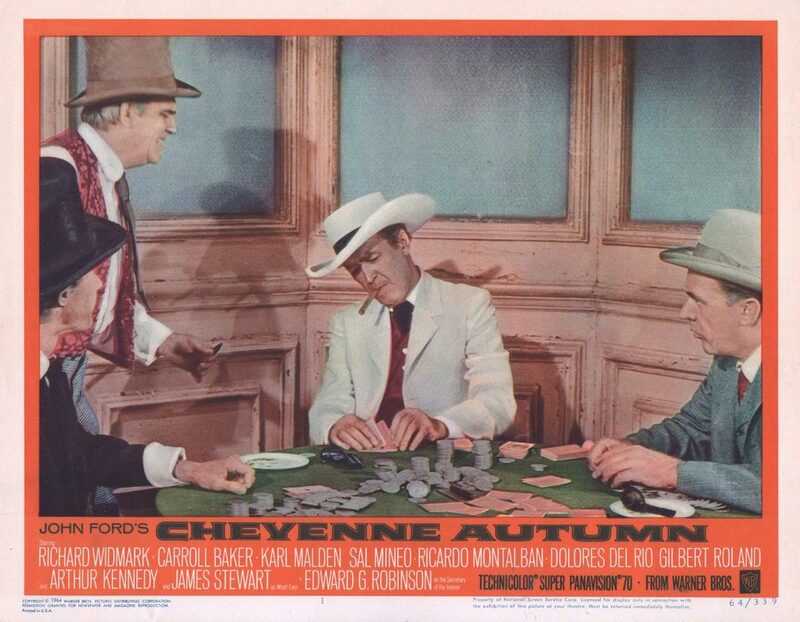 Cheyenne Autumn itself is indebted to the actors John Ford loved and with the budget provided to this epic, the cast is a tremendous last hurrah for a variety of actors he loved. The screen is populated with faces like Harry Carey Jr., James Stewart, Richard Widmark, Dolores del Rio, John Carradine, Ben Johnson, George O’Brien (who goes as far back as 1924’s The Iron Horse) and stuntman Chuck Hayward. But the film feels like a clash between the old and new. Karl Malden plays the German expatriate Capt. Wessels, who has a vast, self-taught knowledge of Native Americans, but has a by-the-book attitude when it comes to military order. When he breaks military rules by getting drunk in a moment of moralistic loathing, he throws a fit that resembles the ferocity of Elia Kazan, not the classicism of Ford. The physicality and surprising violence feels at odds with Ford’s more quiet and subdued performances that are represented in actors like John Wayne, who never show emotional weakness as it’s also a sign of cracking masculinity. The unexpected star of the show is Edward G. Robinson as Carl Schurz. In the twenty years since World War II, the cynicism of liberal democracy had yet to fully set in the American psyche and was still riding on the triumph over fascism. Ford himself was very much in the vain of Roosevelt Democrats, believing in equal rights for all American’s no matter which race and a strong nationalist slant that came with serving in the war and succeeding financially as the son of two Irish immigrants. Carl Schurz is a liberal politician who wants to protect the Cheyenne from other politicians whose solution is to wipe them off the face of the Earth. As a child of the post-Civil War generation, the influence of Abraham Lincoln is seen through mythological eyes and his philosophy is taken as gospel. Schurz gazes at a portrait of Lincoln hanging in his office, and reflected against Lincoln’s face, Schurz seeks advice. Originally cut by Warner Bros. in the film’s initial run, the strangest detour the film takes is the intermission in Dodge City. Following the end of a montage about journalists spinning and turning the story of the Cheyenne defending themselves into a tale of white murder, we step away from the vastness of the open desert to the modern Dodge City. James Stewart and Arthur Kennedy play western legends Wyatt Earp and Doc Holliday at a card table with John Carradine as the wealthy and well-dressed Major Jeff Blair. In Ford’s My Darling Clementine (1946), Henry Fonda’s depiction of Wyatt Earp is that of a noble idealist who brings civility and respectability to the down of Tombstone. Jimmy Stewart instead depicts him as a mean-spirited egoist who shoots a man in the foot, and performs an impromptu bullet removing operation on that man with one bottle of whiskey and a knife. When pandemonium erupts over the impeding fear of the Cheyenne invading Dodge City, a rag tag team of drunken and incompetent vigilantes, prostitutes, and a bar atop a horse-drawn wagon gather to chase the Cheyenne out. Instead, things go haywire when everyone proves to be useless and misdirected, ending with a moment closer connected to the antics of silent movie comics, complete with a lady’s undergarments being exposed. Ford’s poetic vision of America never look at marvelous as they did toward his late period. 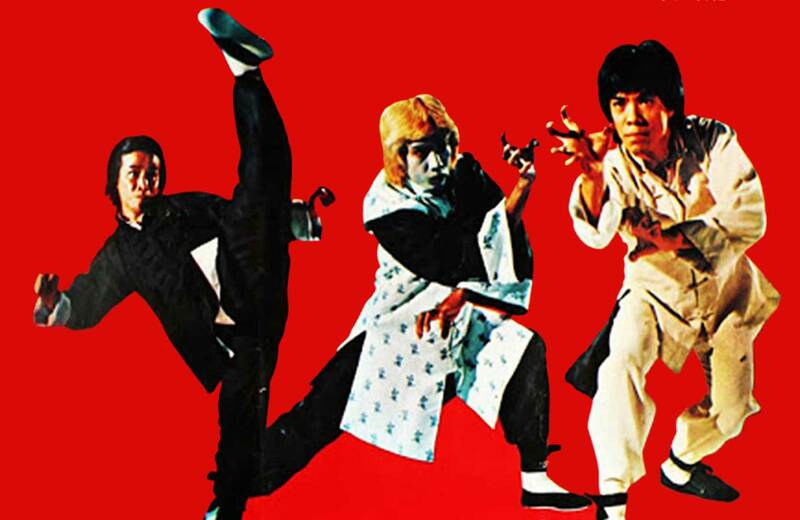 Though Ford himself preferred to work in black and white, he became one of those rare filmmakers who used color not to create a Technicolor dreamscape, but to create a dustier, browner, grimmer world punctuated with bright primary colors. In his fourth and final collaboration with Ford, cinematographer William H. Clothier seemed to be rejecting the flattened sets of television westerns of the era. Shot on Super Panavision 70, people are photographed and placed elegantly along the tremendous vistas of Monument Valley, where the shots being to resemble more the art of European neo-classicism than it does cinema. Humans stand and are placed in bright lights that radiate and shine them against the dark, sunken, and endless landscape. The blues of the United States cavalry uniform or against Red Shirt’s clothes punctuate the landscape with pulsating hues that direct your eye toward them. Ford’s cinema and the man himself weren’t meant much longer for the world. The western split into multiple directions: to the quickly produced television escapades of Bonanza and The Virginian that rejected Ford’s eye and respect for American history in favor or storytelling, or toward the directions that Sam Peckinpah and spaghetti westerns were taking it with pulpier, more violent films that seemed to be simultaneously in love with and critical of the genre. Directing only two more features, one which needed to be completed by Jack Cardiff due to Ford’s becoming ill, John Ford passed away in August of 1973, just four months after receiving the first AFI Life Achievement Award. In a letter to Ford biographer Tag Gallagher, Ford comments that “Hollywood now is run by Wall St. + Madison Ave”. Ford’s cinema feels even more revolutionary and emotional in today’s film landscape dominated by PR, focus groups, and franchises. 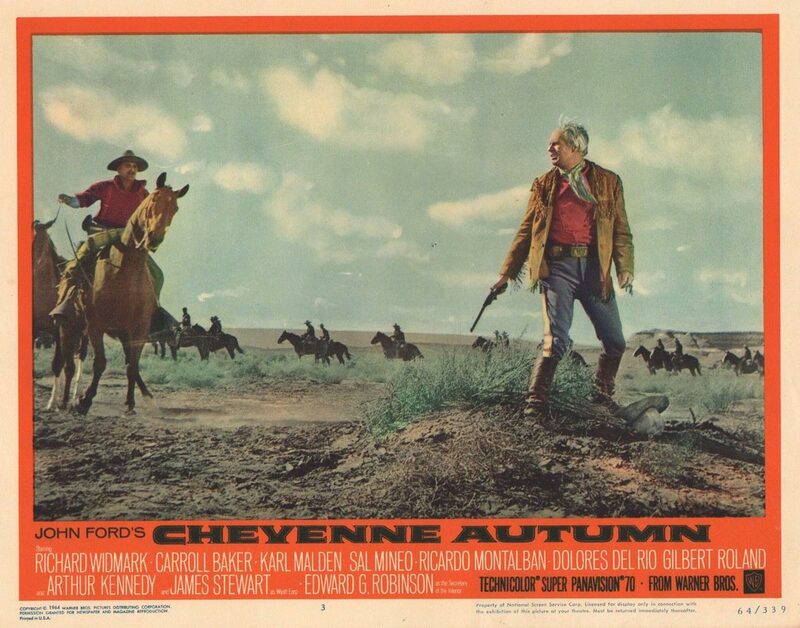 Cheyenne Autumn screens May 21 & 22 from an I.B. Technicolor 35mm print courtesy of Lowell Peterson, ASC.